Home / Blogger of the moment / The PS1 Bag Creates a Celebrity Style Sensation! The PS1 Bag Creates a Celebrity Style Sensation! If you want a bag with bohemian, slouchy cool then you’ve got to have the PS1 messenger bag. Celebrities are racing to Proenza Schouler counters everywhere and buying them up in every shade available. We’re not kidding. We’ve seen Leighton Meester in different paparazzi photos carrying the bag in every shade that Proenza Schouler makes! Check out the gallery of stars that are keen on the PS1 It bag! It’s a rather simple bag with no excessive hardware, studs, or fringe in sight, and yet it’s the minimalist appearance that has everyone going crazy. 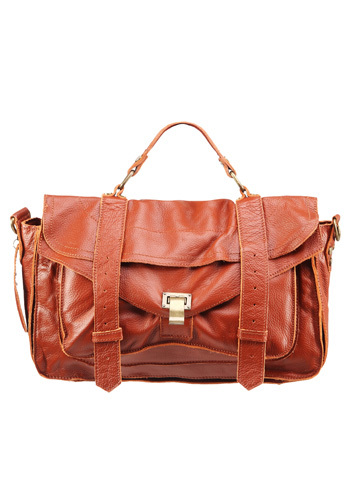 In a utilitarian style, this suede messenger bag can be worn by both men and women. One thing is for certain: this bag is not a one-hit wonder. In fact, we’ve seen celebrities from Jessica Alba to Nicky Hilton carrying this bag on dozens of occasions.It’s simple, almost equestrian appearance, goes with everything. It is easy to see why this bag has caused such a style sensation.